Q-Games’ PixelJunk series combines simpler cartoonish graphics with decently in depth gameplay, as suits a downloadable console game. We’ve played the Monsters variant before, a decent tower defense game, and this is the other game of theirs that’s on the list, obviously a shooter this time. It’s not really a series, beyond the creator being the same and a shared name. Even the art feels flatter and simpler, although the underlying systems might be a reason for it. Although there are a bunch of enemies to kill in this shooter, the main focus is on rescuing these workers trapped in the mines.I couldn’t immediately identify the games where we did that before, but I’m sure we had. The unique mechanics it introduces are interesting and really change the game. It introduces lava and water early on, both with their own interactions – water is safe, mostly helping by cooling you down, while lava kills you until you get certain suits, heats you and kills your rescuees – but works to get rid of ice and enemies. The liquid physics used are quite impressive and play into the puzzles throughout and it’s incredibly satisfying to get the combination right and make your way through. It’s what turns the game into more than just a shooter, as manipulating the environment becomes as important as shooting enemies, and there are times where the latter became more of an inconvenience than something that felt necessary. It was still enough to keep you on your toes, and they’re used in the right amounts, but they’re more realistic obstacles. 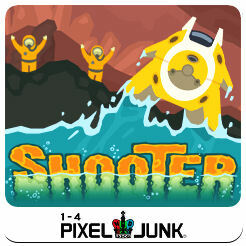 As much as Pixeljunk Shooter is set to be a shooter, the highlights are the liquid physics and everything that flows from it. It’s a delight to mess around with and creates enough special situations to stay interesting.